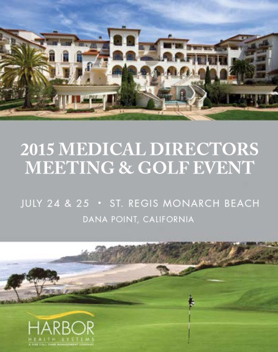 The 2015 Medical Directors Meeting combined frank and insightful discussions, new data on results in medical management and indemnity costs, and ideas for continuing to improve the system’s efficiency and patient outcomes. “I always look forward to our annual meeting because I get the opportunity to connect with some of the most forward-thinking individuals in the workers’ compensation industry,” reflected Gregory Moore, MPH, Senior Vice President of Innovation for One Call Care Management. 12.5 percent lower indemnity costs. 11.2 percent fewer indemnity claims. 12.5 percent fewer days off work. Greg Moore, MPH, Senior Vice President of Innovation for One Call Care Management, addressed the current state of the California workers’ compensation system as well as the status of the Medical Provider Network (MPN). David North, President and CEO, Sedgwick CMS, spoke about the need for innovation in medical management for injured workers, and making access to the healthcare and disability system easier for injured workers. He recommended closely examining the changing healthcare delivery system in order to anticipate and design the next steps needed in workers’ compensation. Theodore Blatt, M.D., FAAOS, Medical Director, Harbor Health Systems, spoke about best practices for physicians in the workers’ compensation system, how outcomes-based networks are changing workers’ compensation and key objective measures of claim outcomes. John Robinton, M.D., Medical Director of Neurodiagnostics, One Call Care Management, shared best practices in neurodiagnostic studies to ensure accurate test results to guide workers’ compensation care decisions. Agents of change identified in workers’ compensation include the advancement of technology to improve timely access to best providers and regulatory initiatives like California’s SB 863 which is helping to improve access and efficiency, reduce costs and lower the administrative burdens for payers. To learn more about how Harbor Health Systems can help lower claims costs for your organization, contact us today at (949) 273-7020.